A team of developers based in Montréal Canada have created a new wireless plug and play environmental control and growing system called Motorleaf, which can help you monitor and track any indoor growing plot. The system consists of a small wireless monitor and companion smartphone application which allows you to easily monitor the growing conditions of your crop from wherever you may be. 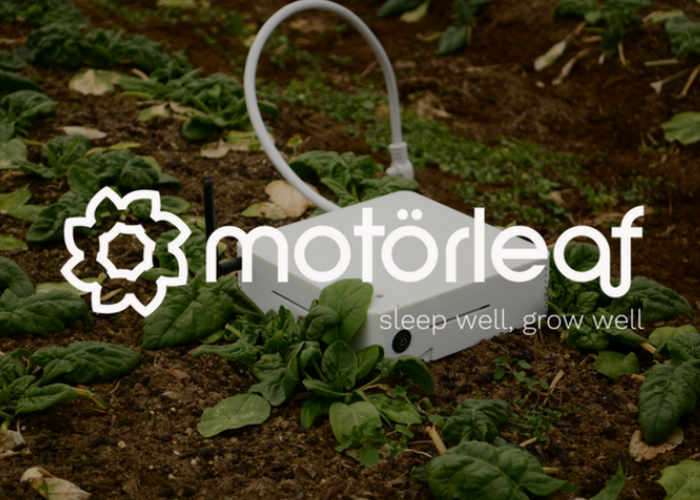 Watch the demonstration video below to learn more about Motorleaf, the inspiration behind it and the features it can bring to your indoor farming. Motorleaf is taking the world of indoor agriculture by the roots and turning it on its head. Designed by growers for growers, Motorleaf specializes in designing and producing some of the most innovative hardware and software that, essentially, enable plants to grow themselves by using data and algorithms. We’ve been crafting and perfecting the future of grow equipment for some time, and now we’re incredibly proud to present the latest line of Motorleaf products. Our aim is to dramatically change the world, by lowering the barrier of entry so millions of people all over the world can embrace growing crops for themselves and each other. Motorleaf is a fully-integrated system comprised of four different hardware components. With Artificial Intelligence and Machine Learning-enabled hardware, Motorleaf is leading the way for indoor growers, allowing them to turn their existing indoor grow rooms and greenhouses into smart, connected grow operations. In short, we put the power to control your plants right at your fingertips. Designed to be a plug ‘n’ play system, you decide which parts of your grow operation you want to control, monitor and automate. All Motorleaf products come with free software, however, our Kickstarter backers will get an upgrade to the premium set of features for 6 months! For more information on the new Motorleaf jump over to the Kickstarter website for details by following the link below.